BANJA LUKA, Bosnia-Herzegovina - Milan Jelic, president of Bosnia's Serb Republic, died of a heart attack yesterday after less than a year on the job, the prime minister said. He was 51. Dr. Jelic suffered the heart attack while watching a soccer game in his hometown, Modrica, his brother Slavko said in Serbia. The president was a former soccer player himself and was president of Bosnia's Soccer Federation. Dr. Jelic was elected president of the Serb Republic - one of the two mini-states that make up Bosnia and Herzegovina - in October 2006. The other republic is the Bosniak-Croat Federation. The presidency is a largely ceremonial position, with power exercised by a prime minister. Born in 1956 in north Bosnia, Dr. Jelic earned a doctorate in economics and was the head of the Modrica oil refinery for 13 years. He was a member of the Serb Democratic Party founded by wartime Bosnian Serb President Radovan Karadzic, who is now a war crimes fugitive. But in 1998, he switched to the party of Independent Social Democrats, currently the most influential Bosnian Serb party. 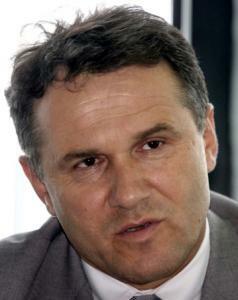 Before he was elected president, he served as minister for economy, energy, and development in the Bosnian Serb government. In Belgrade, Serbian President Boris Tadic called Dr. Jelic "a good president and a true friend of Serbia." It was unclear who might succeed Jelic. The peace agreement that ended Bosnia's 1992-95 war divided the country into two ministates, each largely autonomous, with its own president, parliament, police, and army. The two are linked by a central government, a parliament, and a three-member presidency.